Gymnastic rings were once specialist and you never saw them in gyms unless you found yourself in a gymnastics centre. Fast forward 10-15 years and the rings are very much in. If you’re not already sold on Gymnastics rings, read this post: What EVERY gym SHOULD have. That post will outline what’s so cool about the rings and why they’re one of the best pieces of training equipment you’ll ever own. Something I didn’t include in said post was the ease the rings offer in regards to choosing a training location. Being typically British for a moment, I’m going to moan. Why are there so few good outdoor exercise parks in the UK?! While we await the answer we can get around the shortage by taking our set of rings with us and finding a tree or metal frame with a reasonable amount of height, and throwing our rings up on them. This gives not only convenience but the coveted overhead height needed for things like muscle ups, pull overs and inverted hang pulls. I Get it. Rings are brill. Tell me something I don’t know? A common question on the minds of potential ring buyers is: Should I go for wood or plastic? I have experience using both and will attempt to answer this question. I own a set of cheap plastic rings at home. You can see the epic green colour in the video below. Having recently trained with wooden rings I can tell you there’s no competition between the two. Wooden rings are much nicer to grip and don’t wreck the hands anywhere near as much as plastic ones. Anyone who has ever practiced ring muscle ups will know the classic skin tearing and callous inducing nature of the false grip. Training on plastic rings, I just accepted this as part and parcel of ring muscle ups. The remnants of a callous from false grip training! Having now done muscle ups on wooden rings, I can say the skin damage is much less pronounced. You get a little blister but it’s nothing compared to the destruction of plastic rings. Wooden rings are easier to grip too. If you start to sweat, the plastic rings become almost permanently moist for the rest of the session; you’re always wiping them down. 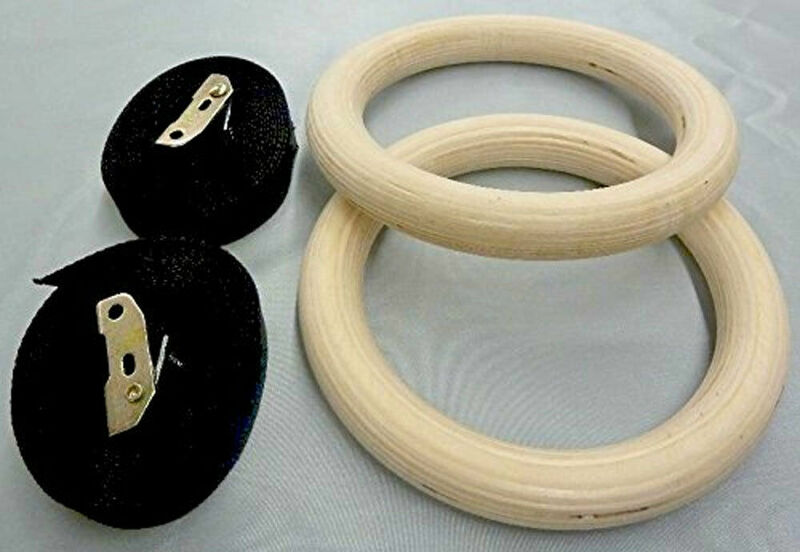 I used to (wrongly) believe wooden rings were much more costly than plastic but according to recent research, there’s not that much in it at all. On Amazon UK you can get plastic rings as cheap as £15 and wooden rings as cheap as £20. For the £5-£10 general price difference, I’d say there’s only one choice – and that’s to go with wood. Does this mean plastic has no use? No. Plastic rings may be fine if you just want to use them for pushing exercises and more beginner level pulling exercises, such as body rows and normal grip chin ups. However, if you’re looking for longevity and avenues of progress to remain open and fully available, the wooden rings will serve you better. What do you think? Have you used both or just one? How do you find they measure up? Previous Previous post: Is the ‘REST DAY’ really necessary?? Straight Talking Fitness Wooden VS Plastic Gymnastics Rings – Which to buy?